Irfan says to Kabir that can you do what I want? Kabir says yes, I will do anything, I will ask forgiveness from Zara too. Irfan says you have shown your low thinking, you have insulted your position, will you be able to remove the stain from your character? Kabir asks him to sit. Zara sits Kabir. Kabir says to Irfan that I will remove all your complaints, please forgive me. Irfan says your eyes are promising but I am not sure about your intentions, God bless you. Reema comes there and says you both should have another honeymoon, look at Kabir’s shining eyes. Zara says he made breakfast for me, Kabir says for both. Reema says priest have fallen for you again, Kabir smiles. Zara says only 25 days are left for divorce? Kabir makes Irfan wear hat and says Zara I know what j have to do. Nilaofar comes back to Ayesha’s house. She greets everyone. Kabir comes there and says to Miraj that we should go for work. Shahbaz says you should take rest. Kabir says I am fine now, work needs my attention. Ayesha says you should stay at home. Zara comes to them. Shahbaz says if he wants to go then let him go but I want to ask where did you go in the morning? Kabir says to Irfan’s house. Shahbaz says you are ill, what was the need to go there? Did nobody stop you? Especially people who show they care so much about you, the person who me you call a wife, didn’t she stop you? Kabir says it was not about Zara, I wanted to gg o there. Shahbaz says why? Kabir says Irfan was insulted in the inauguration, I heart so I went there to ask for forgiveness. Shahbaz says now you will ignore your father but your wife’s father is more important than your own father? Kabir says its not like that, I know you are my father, you made me learn to walk but I don’t need anyone’s support now. Ayesha says, Kabir. Kabir says no I am not a kid anymore, I will take my decisions now. He leaves from there but Zara stops him. He asks her to move aside. She says please, Ayesha is stopping you, I am stopping you, please don’t go, don’t be angry, you are not well, please stay for me. He looks into her eyes and shakes his head. Ayesha makes him sit down. Reema says to Imran that I feel Kabir and Zara are fine now, I saw Kabir taking Zara’s side and Zara taking his side, maybe he gave divorce in anger. Imran says I know Kabir is very well, he must have thought a lot before a divorce, did Kabir say that he will take divorce back? She says no. 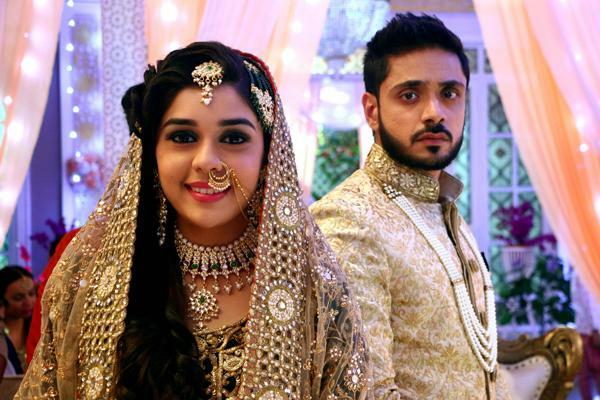 Imran says that their relationship still has trouble. Zara says to Kabir that you should not have talked like that your father. Kabir says he doesn’t understand that I have only 25 days left, I want to make them beautiful for you, you know I say I thought a lot before breaking this relation that’s why I gave you divorce. Zara says I pray that God shows you the right path, your decision will define our future, I know you thought about divorce but can I ask you 2 questions? He says yes. Zara says the first question is why did you divorce me? She sadly looks at him. Kabir says what is the second question? If you don’t realize why I gave you the divorce then it’s of no use, I will tell you the reason when I give you a second divorce. Zara says who gave you Mahar’s one crore? Kabir says I don’t like to answer that. Zara says you are not answering me, then how will you make my day special? You could ask me anything. Kabir leaves from there. Zara thinks Kabir is hiding something, I have to find out. Zara comes to Ayesha in the kitchen. She asks if she can do one work? I don’t know how to say it but I have to find out. She tells her something. Ayesha says ok I will find out, don’t worry. Zara thanks her and leave. Kabir is reading files in his room. Zara comes there and smiles at him. Kabir points at Miraj and sits with him. Zara looks on. Miraj sees Zara standing there and stares at her. Zara comes there. Miraj stands up close to her. She gets frustrating. Zara says to Kabir that you promised me and staying here? Didn’t you plan any surprise for me? You were do something special for me. Kabir says what do you want? Zara says come with me. She takes him from there. Miraj looks at her and says Zara’s magic is worthing on me too, I will get this divorce done and make her mine too, darling Miraj. Zara says to the family that Kabir wants to do something special for me so I thought that all the husbands of this house should do something special for their wife’s. Zeenat ask Kabir are you going do it? Kabir says yes, making wife is not a mistake. Zeenat asks Kashan to here from his brother. Amaan says I will do something for Alina. Ayesha says to Shahbaz that tell you, kids, that you are no less. Shahbaz says tell us, I will gift you. Zara says you can’t buy a gift, its a condition that no husband will bring a gift for his wife, you have to do something different. Miraj comes to Nilaofar and says come, I will make your day special. Nilaofar says its impossible brother. Miraj says just give me chance. She smirks at him. Kabir says to Zara that I am not answering your questions. Zara says that Shahbaz didn’t give money to Kabir. Zara thinks then who gave it? What did Kabir do? Miraj says to Nilofar that love is like that, humans fall in the fire pit. He pulls her closer and romances with her, he hugs her and gets intimate with her, Nilofar smiles. Zara is passing by their room, she is shocked to see Nilofar and Miraj intimate as she thinks that are sister-brother. Zara runs to Kabir and says I have to tell you something. Previous article‘You Need A Better Attitude’ Katrina Kaif Faces Misbehaviour By Salman’s Fans In Canada.